Released along-side its console, the original Red Steel was promoted as the sword-sim you\'ve always dreamed of. The game seemingly failed to create this "sword-sim." The outdated visuals, clunky controls, sub-par combat, and the disappointing sword play all contributed to this. Over three years after the Wii\'s release comes Red Steel 2, with the newly released Wii MotionPlus. Many hoped it accomplished what the first did not, the question is, did it? Combat is the main draw to Red Steel 2. You swing your sword simply by swinging your arm. If you swing in different directions with your arm, then your character swings in different directions with his sword. The game is entirely in first-person except for certain cut-scenes. This makes the player truly feel like they are their character, swinging their sword through hordes of enemies. Red Steel 2 runs at a fantastic frame-rate. I encountered no dips throughout my entire play-through, which makes combat feel smooth and fast. Swordplay is also incredibly satisfying; seeing your character stab and slice enemies during a hard battle is rewarding and fun. Swords are not the only weapon in Red Steel 2. Guns also play a factor. Players use their gun similar to every other Wii FPS. You point your Wii Remote at the screen and fire with B. Characters can unlock four different types of guns: a revolver, a machinegun, a double-barreled shotgun, and a rifle. The only problem with guns is that ammo is limited, making you not want to use them. Too many times I would run screaming into a horde of enemies with only my sword simply because I didn\'t want to waste ammo. Strong Points: Great combat, tight motion controls, a solid frame-rate, and good-looking visuals are the strongest points of this game. A great reward system is also good your first play through. Weak Points: Inconsistent difficulty, bad voice acting and music, a strange bug, and some strange button controls are the only weak points in Red Steel 2. Moral Warnings: Brutal sword moves, plentiful but brown blood, a tightly clothed female character, and some supernatural powers used by the player make up a "T" game that comes close to an "M"
The reward system in the game surprised me. Every quest you do results in a cash reward. You can also attain cash by slicing or shooting open boxes or crates scattered throughout the environment or doing optional side quests. The side quests are rather boring, making you run around and search an uninteresting town for hard-to-find wanted posters or emblems, with hardly any combat to break the monotonous searching. When you do get enough cash, you can use it to buy guns, upgrades for your guns, an increase in damage to your sword, and new sword moves. For me, part of beating the game was getting all the cool new sword moves; each one truly is unique, satisfying, and effective. There are even certain moves you can do with your guns. Also, when you upgrade your guns to their max levels, each one gets a visual flair. When you finish the game, you have the option to go finish the earlier levels with your newly acquired upgrades. I didn\'t find this fun mainly because I had beaten it all already, and that enemies were far too easy and generally would die in one hit, robbing the game of its best selling point. There are some weak points in Red Steel 2\'s gameplay. Enemies can be punishingly difficult at times, then at the very same time they can be incredibly easy. More than once did I die from a group of enemies, respawn, then proceed to wipe out that same group without a scratch to my health. Certain moves are too effective, especially the dodge jump you acquire early in the game. This makes avoiding enemy\'s attacks far too easy. There is one enemy who has a shield on a large chain gun. I found him punishingly difficult. Not only was the only way to attack him on his back, he could swivel faster than you, and block your attacks with the large shield on his gun. He also had a shield attack that was unavoidable if you were in front of him, this move took half your health. Enemies constantly employed cheap tactics, knocking you down immediately after you recovered from a similar attack. This made Red Steel 2 frustrating in a throw-your-over-priced-controller-into-the-TV sort of way. I could not conclude a segment on Red Steel 2\'s gameplay without mentioning the boss fights. These epic encounters are the pinnacles of the games gameplay. These bosses are tough and not cheap like their lesser counter parts. This makes them incredibly satisfying to take down. All of the boss fights are unique with different strategies you need to adapt to. Although running in guns blazing and sword swinging will work if you can deal out damage fast enough. Overall, the incredibly fun sword-fighting, bosses, and great rewards system makes Red Steel 2\'s gameplay a cut above other games. The cheap AI, inconsistent difficulty, and boring side quests are so obvious that it brings the game down several notches. I would like the reader to understand that this is from the Wii viewpoint. The PC, 360, and PS3 generally have better graphics but this is written in comparison to Wii games. 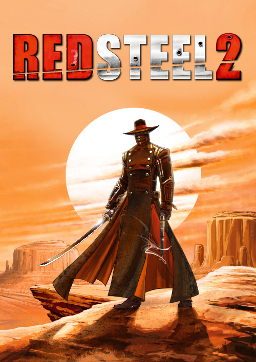 That being said, Red Steel 2 looks really good. Weapons, characters, and enemies are cell-shaded and detailed very well; animations are fluid. Everything in the game looks top-notch in graphical terms. These visuals are maintained at an incredible frame-rate, sucking you into this western world. The animations in Red Steel 2 are just as much a part of gameplay as graphics. Everything from the ways you swing your sword to flipping out your pistol feels and looks great. Enemies react accordingly to the way they met their demise and your character is only too happy to supply them with a great looking death. One mark on the graphics are your companions. These helpers move and act more like robots, with predictable and exaggerated head-nods and awkward mouth-movements, making you feel like C-3PO made his way into different world. The cutscenes are pre-rendered in Red Steel 2. They are the best parts of the game graphically. Characters look like they belong in their cell-shaded worlds and the villains look villainous, if not a little cliché. These are also beset by the dreaded robotic movements, and sometimes the characters move way too fast, then really slow. The sound in Red Steel 2 is mediocre. Guns and swords sound like guns and swords. This should be expected in a 2010 game. The music sounds like a mixture between Japanese folk and country. To put it bluntly, it sounds horrible. The only bright part of the soundtrack is the fight music, which is fast and intense. The voice acting is also bizarre. All your companions are Asian, save one, yet they talk like with thick stereotypical western accents. Your trainer, Jian, was a bright spot in the voice acting and deserves a mention. The enemy voice actors are terrible though. One enemy in particular has deep raspy that\'s so cliché it\'s laughable. Red Steel 2 has one or two minor problems in this area but it\'s not much. Like I said earlier, Red Steel 2 runs at an impressive frame rate, with no clipping what so ever. There are some pop-ins at times that detract from the atmosphere. The worse thing I notice was that at times, enemies could shoot through walls. This was just a strange bug that could\'ve been easily fixed. Red Steel 2 utilizes the Wii MotionPlus well. Your character generally swings where you swing and the swordplay feels good. Players can set the sensitivity from high to low. If you have the sensitivity to low, players have to use their entire arms in full swings to get the correct "strong" strike. This is a great feature for those people who really want to get off the couch to play. One thing I had problems with was switching from your sword to your guns. This felt awkward when you swung your sword then stopped to point at the screen. I cannot see any way they could have improved this though. Controls work fine for guns although sometimes I would find myself accidentally skipping cutscenes because the same button for "skip" is the same button for "reload." There is a pretty big learning curve for the sword controls. Players have to simultaneously press buttons while swinging to do their new combos and attacks. This takes a while to get used to but is effective in the long run. First, I would like to mention that this game received a PEGI 16+ rating; the European equivalent to an "M."
Although combat is the main draw to the game, it\'s also the worst part in the violence category. Combat is fast and brutal. Players deal out destruction with both of their weapon types equally well and brutally. Since the game is first person, players see the sword combat right in front of their face. One sword move you have you stab the enemy in the back but the sword seems to get stuck so the player tugs on dutifully while the dead enemy reacts accordingly. One move depicts the player shoving their pistol into an enemies neck and firing, sending the enemy flying. One cutscene depicts the player stabbing a defeated boss through the hand to keep him alive on the edge of a cliff. The blood is the strangest part of the violence in Red Steel 2. Blood is plentiful, flying out of enemy\'s bodies in large amounts when player stab and shoot the fiends. Forget what your general knowledge of blood is in this game. The bright, visceral red you know from your daily experiences is gone, replaced by a dull, mud brown. This was either to match the dull color-plates of the towns or to simply squeeze in a "T" rating. Whatever the reason, the brown blood is plentiful and even more enhanced by the close up visuals of first person. Swearing is not as much as a big deal. Minor swear words such as "d--n" and "h--l" are sprinkled throughout the game\'s dialogue but not enough to be too serious. One character in particular enjoys the acronym for "son of a b---h."
In terms of sexual content this game is pretty clean. One female character wears a tight shirt with a low neckline but this is the only instance. I encountered no occultic content in this game. The character does use some supernatural powers. These are more tied to a form of martial arts than to a religion and are not elaborated on much after their introduction. Red Steel 2 is a great Wii game. With fast, exciting gameplay and realistic sword fighting, it\'s easily worth a rent or even a purchase. Utilizing the Wii MotionPlus, this sword-sim succeeds where it\'s fore-father did not. If you are looking for a game to keep you busy for 10-15 hours, you should definitely give it a try. Be warned though, inconsistent difficulty, bad voice acting, bad music, and the loosest "T" rating I\'ve ever seen may give you some second thoughts.